Arterial Network a continental network of artists, cultural activists, arts NGOs, cultural enterprises and others committed to developing African arts as means to contribute to democracy, human rights and development in Africa, whose secretariat is based in Cape Town launched its Zambian Chapter in Lusaka recently. The launch was held on August 5, at Kwithu Lodge and the Arterial Network Zambia Chapter became the 30th to be launched on the continent. The launch activities were coordinated by Yezi Arts Promotions and involved a media training workshop on arts and culture on August 4 and the actual launch of the network the following day. 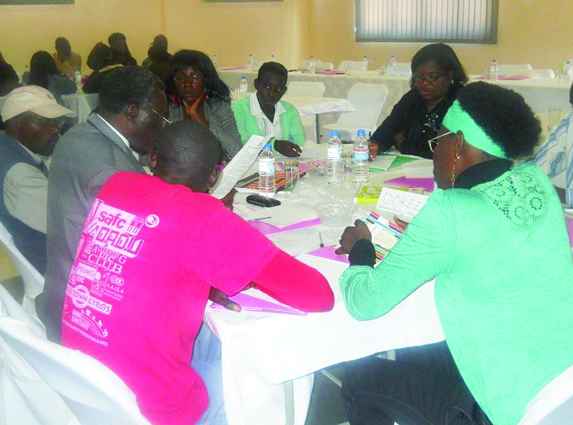 It attracted about 30 participants from a cross-section of the arts and the Arterial Network regional office was represented by Josh Nyapimbi, the chairperson of the Zimbabwean Chapter. Nyapimbi played the role of introducing the network to the delegates as well as giving guidance on how to proceed with the launch of the chapter. He gave a background to the organisation under the theme "Advancing African Creative Sector" highlighting the network’s aims as well as its key funding partners. The key issues that came out of the presentation were that of the advantages of belonging to Arterial Network, funding to the arts and cultural sector and political will from the Zambian government in supporting the growth of the sector. With regards funding, Nyapimbi advised that the Arterial Network in itself does not provide funding but provides a channel to accessing pool funding from other donors. The added advantage of being a member was the readily available information to enhance arts and culture and easy access to certain facilities necessary for the growth of the industry such as festivals and exchange programmes. In closing the deliberation, it was agreed in the house that we must continue to advocate for a Zambian ministry for arts and culture if the arts are to have any meaningful development as a sector. During the launch, a national steering committee was elected to oversee the activities of the newly launched chapter for the coming period. The committee comprises Andrew Mulenga as chairman, Becky Ngoma as vice chairperson, Clive Kawana Secretary, Mwape Mumbi committee member, Dorothy Musukwa committee member. Yezi Arts will provide the secretariat for the operations of Arterial Zambia until the chapter can stand on its own. In March 2007, more than 50 delegates from 14 African countries met on Gorée Island, Senegal to discuss the theme Revitalising Africa’s Cultural Assets. Research indicated that Africa contributes less than 1 per cent to world trade in creative goods and services. Delegates resolved to unite across national borders to address their common challenges. A Task Team was elected to represent the five African regions and a Secretariat was appointed to coordinate the activities of the network. It held its second conference in Johannesburg in September 2009 with 130 delegates from 28 African countries. A constitutional framework was adopted, a 10-person Steering Committee with Zambia's Mulenga Kapwepwe as interim chairperson was elected and country representatives were mandated to establish branches in as many African countries as possible. In terms of constitutional framework, the biannual conference of members elects a Steering Committee comprising two representatives per region to provide leadership for a period of two years. A General Council comprising country representatives (the elected chairpersons of national branches) meets at least once per year to evaluate progress and provide direction for the next year. Members in each country elect a national Steering Committee to oversee the affairs of Arterial Network in that country. It compiles and distributes monthly newsletters in English and French sharing news relevant to Africa’s creative sector and is establishing another publication in Portuguese. If numbers are to be of any consequence, Africa will be well represented at the 5th World Summit on Arts & Culture in Melbourne, Australia this year as seventeen Africans have been awarded bursaries to attend, courtesy of the International Federation of Arts Councils and Culture Agencies (IFACCA). According to a recent announcement in the Arterial Networks monthly bulletin, delegates have been selected from Algeria, Benin, Botswana, Burundi, Malawi, Mozambique, Niger, Senegal, Tanzania, Togo, Tunisia, Uganda and Zimbabwe. Zambia will be represented by Victor Makashi, Director, National Arts Council of Zambia and Prince Lamba, Chief Cultural Affairs Officer, Department of Cultural Affairs, Ministry of Community Development and Social Services. The summit will run from the October 3 - 6 and according to an online welcome statement by Australian actress and Hollywood film star Cate Blanchett, the summit "will bring thinkers, provocateurs and arts policy leaders together to share stories about the arts and its role in our lives." "The Summit theme; Creative Intersections, acknowledges the arts as a thread. A thread that weaves and binds together the many different parts of our lives; health, family, commerce, humanity... It is this precious thread that helps shape our identity and binds together in a common spirit. It is critically important that arts policy makers, the people who directly impart the lives of artists, find time to talk together. The Summit promises to be a creative global melting pot," states the message. As much as Blanchett's meditative statement may be indicative of the summits expectation, it is tempting to muse on how Africa's proxies to world events tend to play a bench warming role and how they often return without much to show, save for conference photographs and a few knickknacks purchased through the cordial provisions of per diems. Zambian visual arts suffered a great loss as one of its iconic art lecturers and religious painters Emmanuel Nsama died aged 70 after a sudden bout of high blood pressure after a normal day of work (at home) and tending to his backyard garden early last week. He was put to rest at Kitwe's Chingola Road cemetery last Thursday after an artistic career spanning well over 50 years. From 1964 to 65, he was trained at the now defunct Africa Literature Centre (ALC) in Mindolo, Kitwe alongside the fabled Akwila Simpasa of the 'ntoba mabwe' fame in the traditional way of how artists used to aid the church's literature to communicate the scriptures graphically and convincingly. ALC was the art school where he would later spend an illustrious career in the faculty. He became assistant lecturer under Canadian artist and director of the Art Studio Marjorie Murray, before leaving for further studies to attend a two year advanced art programme at Sheridan College in Canada from 1966 to 1968 and returning as lecturer in 1970. Through the 70s he worked as a senior lecturer and from 1979 to 1987 he was head of the art department. 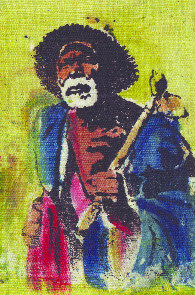 Nsama spent much of his later years dedicated to painting Bible scenes by commission in churches as well as teaching screen printing and batik techniques to willing apprentices. Still prolific until his untimely death, the artist has left over 200 Christian-themed paintings of which his daughter and administrator Mercy Mwansa, also an artist, intends to organise a retrospective exhibition. Among some key figures that have passed through the tutelage of Nsama are the likes of graphic designer and logo maestro Tom Mbumba, the artist behind the last two Zamtel logos before the LAP Green Network takeover, Lawrence Yombwe the influential Livingstone-based artist, and Roy Kausa, seasoned critic and contemporary Zambian art historian. Yombwe described Nsama as one of the best tutors Zambia has ever produced. “The first time I came across a pallette knife or even used one in place of a paint brush was under his guidance. In fact much of the movement in my work is owed to him”, said Yombwe. Kausa regrets the demise of Nsama citing it as a great loss as well as a lesson to Zambian academic institutions to take stock of seasoned human resource while they are still alive. Kausa said Nsama was a lecturer and a senior yet a friend with whom he shared much while at ALC and beyond. He said if there were 10 humble people in Kitwe, Nsama would have come first. 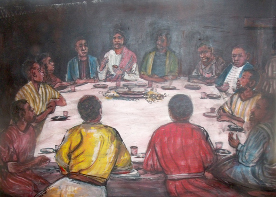 Kausa also added that in Zambia Nsama was among the first to depict biblical scenes in an African light, for instance painting the 12 disciples with African faces. But that not only did he have the passion to depict Christ and the life of Christians, he personally practiced Christianity and would preach the word of God through art. A visit to a number of parishes in Kitwe today will reveal his large murals on the walls. Probably to echo Kausa's cry at the loss of Nsama as an artistic fountain of knowledge, it would be fitting to highlight the demise of ALC as a Pan-African institute that provided quality art and journalism training for over 30 years drawing students from as far as Myanmar, Pakistan and North America. 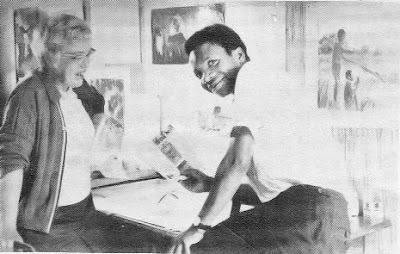 ALC was the first higher learning institution in Zambia to provide computer assisted art and design vis a vis newspaper design, introducing desktop publishing on Apple computers in the early 90s. But the school's meteoric rise within the realms of innovative tertiary education left a crater of deficiency in art and journalism training in Zambia when the institution, co-funded by the World Council of Churches finally collapsed owing to mismanagement in the mid 90s. As a lecturer at the institution, Nsama was an all rounder teaching painting, photography, graphic design and textile design. He is survived by wife Ireen whom he married in 1963 with whom he has 7 children and 16 grandchildren. Among his earliest collectors are hotelier, art patron and formerly voracious art collector Gaudensio Rossi.